As much as I hate breaking the hearts of modish somm(elier)s, importers, retailers, distributors, disciples of unmanipulated beverages and gudgeons for the cryptic, the oracular, the enigmatic… It has to be said—“natural wine” is not enough anymore. I know what the partisans are (or should be) thinking; “Damn! Did somebody finally realize that we were trying to pass off a set of amorphous principles as if they were impermeable dogma? Has our attempt at categorically defining a wine movement, while reserving the right to conveniently adjust the parameters along the way, been superseded by something even less concrete?” Yes, my friends, yes!!! The votaries of supernatural wine avoid the nebular convolutions of natural wine by refusing to provide any axioms, practices, or definitions regarding their campaign whatsoever. I can assure you those very rigid criteria and maxims incontestably exist, in fact, they are the very crux of supernatural wine. But by proceeding furtively the supernaturalists successfully avoid the perpetual contradictions of their more transparently oxymoronic naturalist counterparts—if I don’t tell you what the rules are, you can’t accuse me of erroneously recalibrating them! Preternatural wine being perhaps a bit too metaphysically challenging, I believe that supernatural wine could be the way of the future. Of course, this is mostly in jest. A significant portion of my very favorite wines of all time are considered “natural” by even the strictest definition of the word, and I’m enthusiastically responsible for the import and representation of several producers who proudly adhere to these tenets. The best of these recognize that pragmatism is the only realistic and sustainable approach to this school of winegrowing. 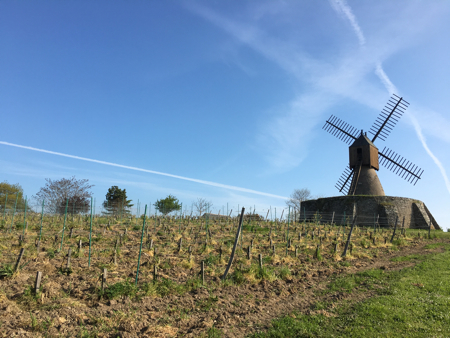 Photograph by Al Drinkle, Damien Laureau’s Petite Roche vineyard in Savennières. Al Drinkle, who is a rock-and-roll shouter and a German wine fanatic, manages a wine shop in Calgary, Alberta, called Metrovino. He has also written articles for The Art of Eating, including a review of Alice Feiring’s For the Love of Wine.